Is Obama a Mac and Clinton a PC? In a previous review for a different site I praised the design on Barack's site for resembling the "gumdrop"/Aqua interface of the Mac OS. His My Barack Obama site riffs on Facebook or MySpace. Obama is clearly the candidate of the new and the now. But what does this make Hillary? McCain? Huckabee? All I know for certain is that Ron Paul is Linux. Oddly beloved by nerds. Looks good from afar but the more you learn about it the less you like it. Believed in by a very small segment of the population who are incredibly vocal. I just hope Obama doesn't have the same life cycle all my Apple products do -- Six months of joyful perfection, then a random traumatic breakdown after which it never works right again. I know that's a true-ish statistic, but Jes-s Steve, have some faith in people. p.s. Will someone buy me a Macbook Air? Much like Trailers Week before, Probably Awkward seems to have entered another inadvertent theme week. This week we've been speaking about outrage: the fear Burma will become another Tiananmen Square, the anger that someone as dumb and anti-intellectual as George Bush could attack someone's smarts and now, this New York Times story about Verizon exploiting common carrier laws to squelch free speech by refusing to carry text messages from Naral Pro-Choice America. I believe in abortion rights, as a feminist, an agnostic, and a quasi-libertarian. Verizon licenses the public resource of the cellular airwaves. Other carriers cannot easily enter and compete. As such Verizon is a government-sponsored semi-monopoly and therefore subject to certain rules. However, the rules requiring uncensored communication only apply to verbal speech and not to text messaging, a technology that was not in use when the regulations were created. From the article: "In rejecting the Naral program, Verizon appeared to be acting against its economic interests. It would have received a small fee to set up the program and additional fees for messages sent and received." I'm waiting for their next campaign, where an "unborn child" is screaming in the womb: "Can you hear me now?" Rand had a reputation for living for her own interest. She is said to have seduced her most serious reader, Nathaniel Branden, when he was 24 or 25 and she was at least 50. Each was married to someone else. In fact, Mr. Britting confirmed, they called their spouses to a meeting at which the pair announced their intention to make the mentor-protégé relationship a sexual one. I do believe the Times just labeled Ayn a cougar[Wikipedia]. Rowwwwr. 2. A few weeks ago, Time magazine had a cover story asking the question, Are We Failing Our Geniuses? a question Ayn was asking 20 years ago in front of a "live studio audience" on Donahue. "A market level of much less than 95 percent would be a way of measuring success ... You can't draw a line and say exactly 50 (percent) is correct, but a significant drop in market share is what we would like to see." Allegedly, Microsoft's crime was anti-competitive behavior and abuse of a monopoly. In reality, Microsoft's crime seems to be its great success. While I believe Ayn would object to Microsoft's use of government power and influence to reach their current position, the EU's use of their power to smite Microsoft for its unprecedented success probably has her rolling in her grave. That's technology. If they bought it this morning, they should go back to where they bought it and talk to them. If they bought it a month ago, well, that's what happens in technology. I know this isn't the worst thing that has ever happened. But it's like Apple is trying to piss off their early adopters. It's because they know we'll just come crawling back like junky whores. Steve Jobs has done some crisis control to pacify the mac faithful. Text of letter after jump. Thanks go out to Joe for the information. Today Apple Computer released new iPods: A Nano that Does Video, the Shuffle in new fashion colors, and a new iPod Touch that does everything the iPhone does except for make phone calls, send text messages, and take pictures -- all for $100 less. This news made me feel a little blue, making me wish I had waited on buying the iPhone. Then I thought about the joy I got from only needing one gadget in my pocket and felt okay again. The announcements ended and I went to a meeting. When it finished I checked my phone for text alerts from MacRumors and I learned Apple dropped the price of the iPhone $200. As an early adopter, I'm used to a second generation product coming out that's faster, better, and cheaper. HOWEVER, that product and price drop usually do not come out for at least 6 months. This time getting a product 2 months early cost me TWO HUNDRED dollars. I'm so angry I can barely think straight. I've been meaning to write a glowing review about how this product lets you live in a magical bubble of silence but now my head is filled with unspoken screams. I know this is nothing compared to HT's recent apartment betrayal but it is completely maddening. Today is AH's birthday and I was considering getting him a new iPod a a gift. Now he'll have to console me as I fight my urge to throw the iPhone against a wall. Hey! On the bright side, now if I break my phone out of rage and frustration it will be a whole lot cheaper to replace! Dear Readers -- I can't guarantee that there won't be an imminent platform change over to Typepad, the land of the user-friendly customizable website, but until I lose my mind again, I (re-)give you the blog, mid-redesign. Please be kind as we go through our growing pains (read: learn the ways of the XML). They don't teach this sort of thing in political philosophy grad seminars! Last weekend, HT and I embarked upon a trip to our friend MJP's wedding in rural Maryland. No combination of plane, train, and cab could get us to the event so we decided to rent a car, an easy proposition in theory but deceptively hard in practice. First, HT schemed that we could take a chinatown bus to Baltimore on Saturday, walk a mile along a highway and below a scary underpass dragging our suitcases behind us to arrive at the rental car location. We would then drive a half hour to the wedding and return the car the following day, drag our suitcases back to the bus depot and return home. Not the most convenient plan, but one that would work. However it turns out all car rental locations in Baltimore are closed on Sunday except at the airport. G-d said Sunday was the day of rest and Hertz was not about to interfere with his divine plan. Then HT proposes we go to Newark and get a car there. I share my experience of being quoted one price on Travelocity and then showing up at Newark airport with an NYC driver's license and being told the rate was significantly higher because of the dangers of city-driving... even though I was driving into pastoral upstate new york and not the wilds of Brooklyn. HT checks, this is true, and we contemplate our next move. When all seems lost HT comes up with a brilliant idea: Greyhound roundtrip ($20) to Philadelphia. An 8 block walk to Enterprise. A 2 and a half hour drive to Maryland. The trip to Philly is without incident despite the long line for the bus. We are separated for most of the trip but eventually my seatmate (a lovely older lady who enjoys mysteries) gets off and we are reunited. i had originally picked a compact car, as opposed to an economy one, because i think i have an apocalyptic/cognitive aversion to the notion of an econo car. it's the same price. I say to her now, "You just know we're going to get upgraded to a PT Cruiser." This has happened to everyone I know. Did the rental car agencies buy all of these monstrosities after the trend ended and no one renewed their leases? We arrive at the Enterprise and after a long wait are told it's our lucky day. Our compact car is going to be upgraded FOR FREE to a lovely... PT Cruiser. Or for $10 more we can get a compact SUV or a Prius. HT and I look at each other and attempt to decide what kind of douche we really are: The sanctimonious, "environmentally-friendly brand" kind OR the soccer mom in training. There are many things HT and I have in common: a love of red meat, an appreciation of a good ruin, and a hatred of... well, pretty much everything else. But one thing truly unites us: Both HT and I utterly lack depth perception. Pitching, hitting, catching, horseshoes -- these things are all lost on us. I believe this might be one reason for our love of photography. The world is already flat and out of focus for us, and a camera lets us find the third dimension with a low f-stop and narrow depth of field. Diopters make the world a little less fuzzy. Perhaps most importantly, cameras give us one more excuse to step outside the moment, pin it like a butterfly and analyze it later at our leisure. This week is devoted to our love of photography and the moving and still image: HT will discuss one of her favorite photographers from a critical theory perspective, and I'll be addressing another camera jockey from my more visceral perspective. Then HT and I will share our favorite image sources on the web and I'll be writing a love letter to my new camera. Oh, Nikon D40x I love you so. Our Sitemeter account allows us to see not only how many people have been checking out the blog, but also, somewhat creepily, what operating system they're on, their monitor resolution (no joke! 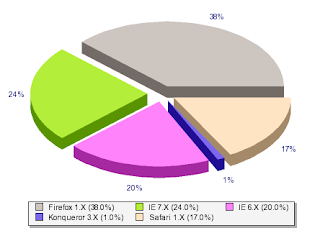 ), and what web browser they use. This is a pie chart detailing browser share: Before I proceed I'll quickly point out that MD (currently still away on the west coast) is the techie in this blogging pair; I have a sub-layman level of understanding of computers and things like RAM and XML. That said, I'm a little confused as to why 44% of our readers are still using some form of Internet Explorer. (And also: what's Konqueror?!) Unless you've got a Mac and use Safari, there's really no reason why you shouldn't be looking at this blog right now on Firefox. Seriously. So much better. Get on that, people. I expect to see a radically different pie chart by week's end.